Add a listener to the session object. Find the bit stream by sampling on the rising edges. MATLAB® is able to communicate with instruments and devices at the protocol layer as well as the physical layer. This example uses the I2C feature of the Instrument Control Toolbox to communicate with a TMP102 temperature sensor, and simultaneously analyze the physical layer I2C bus communications using the clocked digital IO feature of the Data Acquisition Toolbox. The TMP102 requires a 3.3V supply. We used a linear LDO (LP2950-33) to generate the 3.3V supply from the DAQ device's 5V supply line. Use an external power supply. Use an Analog Output channel from your DAQ device. Hook up the sensor and verify that you can communicate with it using the I2C object from the Instrument Control Toolbox. Use oversampled clocked digital channels to acquire and analyze the physical layer communications on the I2C bus. In our setup, the NI Elvis II had Device ID Dev4. Acquire SDA data on port 0, line 0 of your DAQ device. Acquire SCL data on port 0, line 1 of your DAQ device. 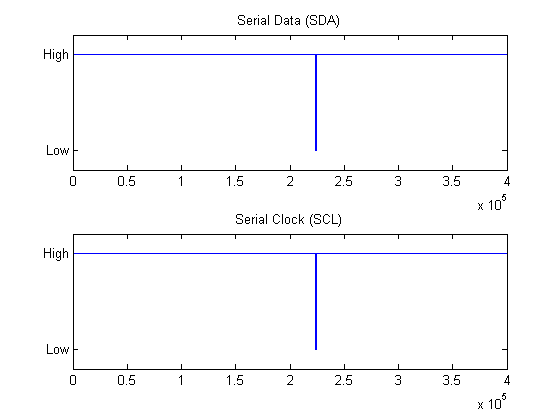 Digital subsystems on NI DAQ devices do not have their own clock; they must share a clock with the analog subsystem or receive a clock from an external subsystem. In this example, we shall use a Counter Output Pulse Generation channel to generate a 50% duty cycle clock at a frequency of 1,000,000 Hz, and set the session rate to match. The clock is generated on the 'pgChan.Terminal' pin, allowing you to synchronize with other devices or view the clock on an oscilloscope. In this example, we import the counter output pulse signal back into the session to be used as a clock signal. Create a listener to collect acquired data to a global variable myData while a session is running in background mode. Set the session to run in continuous mode until stopped. Run the session in background mode accumulating the results in a global variable 'myData'. Accumulate acquired data with a callback function which simply appends acquired data to a column based global array variable. Start the session in background mode accumulating acquired data on the SDA and SCL digital lines to the global variable myData. Warning: Trigger and Clock Connections will not affect counter output channels. Plot the raw data to see the acquired signals. Notice that lines are held high during idle periods. In next section will show you how to find the start/stop condition bits and use them to isolate areas of interest in the I2C communication. Through inspection, we assume idle periods are periods having SCL high for longer than 100us. Since rate = 1MS/s, each sample represents 1 us. idlePeriodIndices: This variable allows us to maneuver between periods of activity within the I2C communication. Zoom into the first period of activity on the I2C bus. For ease of viewing include 30 samples of idle activity to the front and end of each plot. 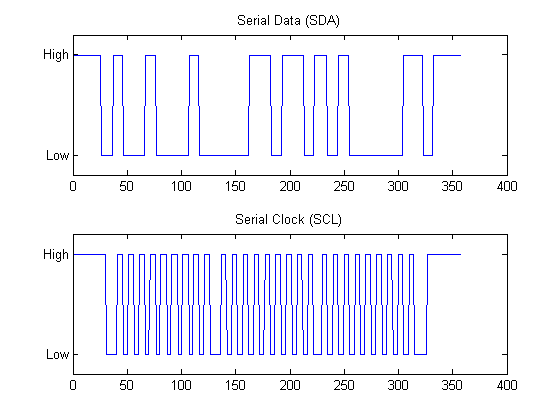 As a simple example we will analyze start and stop condition metrics, and I2C bit rate calculation. Start condition duration shall be defined as the time it took for SCL to go low after SDA goes low. Stop condition duration shall be defined as the time it took for SDA to go high after SCL goes high. Bit rate will be calculated by taking the inverse of the time between 2 rising clock edges. fprintf('Start condition duration: %d sec.\n\n', startConditionDuration); % count 5 pulses, 5 us. Start condition duration: 5.000000e-06 sec. Stop condition duration: 5.000000e-06 sec. The sclFlipIndexes vector was created using XOR and hence contains both rising and falling edges. Start with a rising edge and use a step of two to skip falling edges. % idlePeriodIndices(1)+1 is first rising clock edge after start condition. % Use a step of two to skip falling edges and only look at rising edges. % idlePeriodIndices(2)-1 is the index of the rising edge of the stop condition. Two uint8 bytes were 'fread' from the I2C bus into variable data8... The hex conversion of these values should match the results of the bus decode shown above.